The introduction of the new robust and cost-effective MTN/1330 series industrial grade accelerometers into disynet's portfolio rounds up the very diverse line of accelerometers. It stands out with a very rugged, IP66 water proof stainless steel design. Mountable via the hole in the middle with the provided M6 Bolt and a standard 4-pin M12 connector it fits with a wide range of readily available pre-confectioned mating cables which in turn can be oil resistant and waterproof. The sensor suits for any demanding applications where vibration in all three spatial axes needs to be measured. These could be typically in the aerospace, automotive, agriculture, mining, land machine, road construction industries, as well in research and development institutes in which ruggedness is more important than filigree design and size. The MTN/1330 offers three isolated AC outputs (X, Y and Z axes). Internal electronics to minimize noise, increased bias voltage stability. Other specifications are the standard industrial 100mmV/g sensitivity, 50g dynamic range (max 80g), 2 to 9kHz (+/- 0.5%) frequency response, base isolated, temperature range -25°C to +125°C, 100g weight. 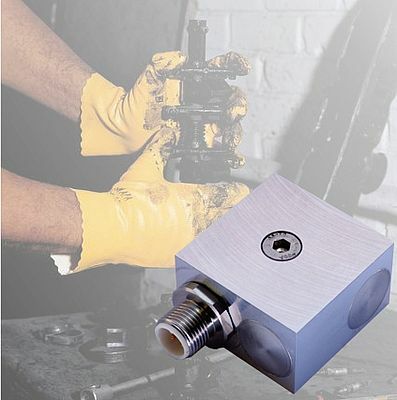 The MTN/1330 is thus a general-purpose accelerometer for rough industrial environments.